I really enjoy working with the Alexa mini. It's compact lightweight and the internal nds convenient for fast schedules. 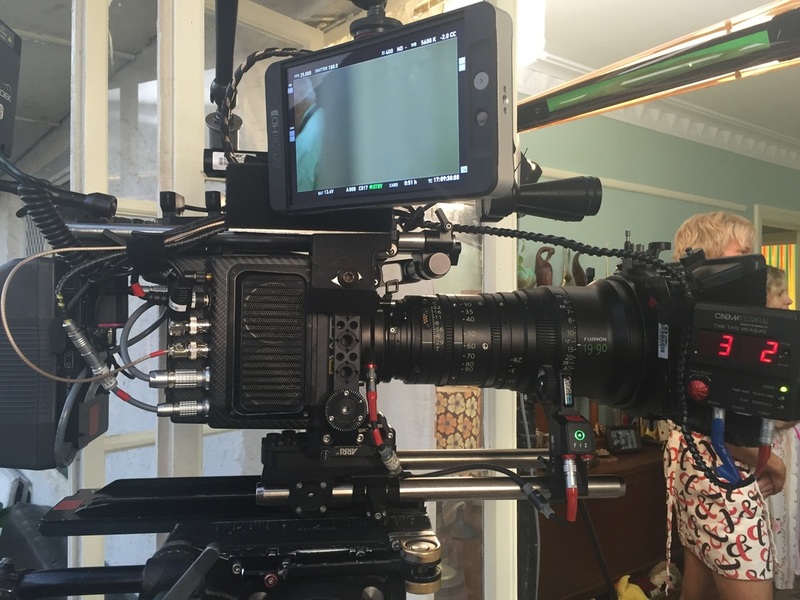 Combine with 19-90 cabrio and the optimo lightweight zooms this completes a flexible package for television drama. For many years people had told me I would enjoy working with Emma Freeman so when the opportunity arose to collaborate with her on Secret City, I jumped at it. Emma is an amazingly talented Director who meticulously plans and clearly communicates what she wants which enables the rest of the crew to deliver their best work. On Secret City we took a classical approach with the coverage and blocking to enable actors the space and freedom to achieve their best possible performances. This was Emma’s mantra and it is this mantra that delivers authentic performances without sacrificing the visual drama. Production Designer, Felicity Abbot and Emma created an extensive visual reference document and combined with the striking locations made my job even more enjoyable. Felicity created another one of her intelligent, subtle yet beautiful palettes that created a look in camera without the need for heavy handed grading. I responded to her giving each location it’s own signature palette by varying the colour temperature for each location. We took influence from 70’s spy thrillers and more recently, Anton Corbin’s “A Most Wanted Man”. In saying that, I used 80’s style lenses (designed in the 80’s) and not used often any more to give that flatter contrast and cooler feel. It was the function of the lenses such as the snorkel lens that captured and created those unusual angles. The simplicity of our methodology meant no cranes or big camera movements and framing actors up close with wide lenses so that we saw the backgrounds was important. How we captured the locations was crucial to the authentic execution of the story. Canberra is visually striking and architecturally distinctive. Unlike most other Australian cities, it has been designed purposely, has no power poles, advertising signs or any visual clutter. Felicity and I also enjoyed working with the restraint that came with some of the brutalist architecture and the public service feel and as a consequence, it is compositionally very uncluttered. We wanted to capture the man-made and the natural atmosphere of Canberra from the fog on the lake to the rows of mass flowering plantings juxtaposed against the austerity of the buildings. Producers Penny Chapman, Jo Werner and Line Producer, Paul Ranford were incredibly supportive and assembled an inspiring crew in all departments, (i.e. Chris Webb (First AD) Leslie Vanderbilt (Make up) Academy Award for Fury Road ) not to mention the exceptionally talented cast. It’s a fascinating story that resonated with the political situation at the time not that this played out until after we had it in the can so in parts it was slightly prophetic. Chris Ullmann and his connections and contacts gave us a very privileged insight into the workings of the capital. Shooting in Parliament House was utterly intriguing and I believe that a compelling script and relevant subject matter most definitely adds to what a cast and crew bring to a project. 5 month after you finish a film you sit in a room for 3 days and Analyse what you should have if done. The benefit of hind site. Luckily I am good hands with Trish Cahill.